TigerBlog looked around the tent at the Grad College last night and saw friends - but not friendships - about to go their separate ways. It's the inevitability that comes with a graduation that is looming less than a week away. TigerBlog sees it each year under the same tent. Four years, gone in the blink of an eye. This time, it's the Class of 2015 that will be heading off Princeton's campus and into whatever their next chapter holds for each of them. The occasion last night was the 18th senior awards banquet, now officially called the Gary Walters ’67 Princeton Varsity Club Senior Awards Banquet. As is always the case, the banquet is on this Thursday in May, followed in short order by Reunions, Class Day and then graduation. The banquet is the start of a long weekend sprint in which the members of that particular class go from business-as-usual teammates and undergrads to alums in a matter of hours. And then, after that weekend sprint, they're off. Friends, with friendships that will endure. It's the best part of Princeton University, and especially Princeton Athletics. They come here when they're 18, from all over the country and outside the country, completely unaware of how special their time here will be. They leave four years later, having since figured out how special this place is, and with a rock-solid foundation of friendships that will never end. TigerBlog saw a reinforcement of that Monday at the NCAA men's lacrosse championship game, where Princeton's 1997 team was honored, 18 years after they graduated. And he saw another reinforcement of that last night at the banquet, in the form of an incredible speech from Jason Garrett, the 1988 Bushnell Cup winner as the Ivy League football Player of the Year and the current head coach of the Dallas Cowboys. Garrett, who accepted the Citizen Athlete Award for outstanding contribution to sport and society, was so good that it was almost enough to get TigerBlog to root for the Cowboys over the Giants next year. Almost. But not quite. Like the 1997 men's lacrosse team, Garrett was all about the enduring friendships and teammates that he found while at Princeton, including the one with his center, current Princeton head coach Bob Surace. Garrett was hilarious at times, and at others he tied that humor into really hard-hitting messages. It was a great combination. For instance, the former quarterback was talking about all of the great reasons that go into choosing to attend Princeton. In his case, he said, it was because "they threw the ball a lot." Garrett told another story about his last preseason game when he was attempting to make the Cowboy roster as a player. He talked about how Troy Aikman, the starting quarterback, wasn't even dressed for the game and was instead eating a hot dog on the sideline. He talked about how he went out for the second half, starting on his own 2 yard line. And how the huddle had 11 players - him, nine others trying to make the team and one established starter, Kevin Gogan, who was stuck playing with the group. How did Garrett describe Gogan? If he walked into this tent, Garrett said, then everyone would immediately think he was the biggest person they ever saw. He was 6-8, 350 pounds. He had a giant head and giants hands. And as Garrett said, instead of being part of that drive he would much rather "be eating hot dogs too." Oh, and he called the red-headed Garrett "Red Ball." And that's where the story took a turn. Garrett talked about how the offense put together three or four first downs and got across midfield. He was feeling pretty good about things during a timeout, and when he came back onto the field, he said he was going to show what a great leader he was. And so he asked the team what snap count they wanted to go on. That's when Gogan took over. "Hey Red Ball," he said, "you're the quarterback. You pick the snap count." The moral? All great teams need leadership. And when you're in a leadership role, Garrett said, you lead. When you're the leader, grasp the mantle of leadership. He also talked about Fred Samara, the men's track and field coach, who worked with Garrett before the NFL combine, when he was trying to improve on his 40 time. What did Samara tell him? You suffer from "finish line anxiety." Don't worry about the finish line, was the message. Just run. Garrett was a great part of the banquet, but he wasn't the only part. This year, unlike years past, there were finalists announced for the Roper Trophy and von Kienbusch Award in advance. The one winner of each award, for the top male and female athletes, were then announced last night. The finalists were all featured in two videos - produced by John Bullis - that featured comments from each athlete's coach and some highlights of the athlete, with voiceovers that chronicled their accomplishments. And then, when those were over, the winner was announced. Women's basketball player Blake Dietrick for the women. Men's lacrosse player Mike MacDonald for the men. Men's tennis player Zack McCourt gave the keynote address, representing the senior athletes. There were other award winners as well, with Tiana Woolridge of the women's volleyball team and Andrew Mills of the men's soccer team honored for service with the Art Lane Award and sprint football player Chris McCord honored for academic achievement. Tara Christie Kinsey, the outgoing Associate Dean of the College, won the Marvin Bressler Award for her work with Princeton's student-athletes. With that, another banquet had come and gone. It was the first for Mollie Marcoux as Ford Family Director of Athletics, who took over as the host from Gary Walters, who had done so for the first 18. To TigerBlog, the banquet is always a great measure of time, the sign that another academic year has essentially ended, another trip around the calendar complete. For TigerBlog, there will be other years at Princeton, other banquets. At least he has no reason to suspect there won't be. For the senior athletes, they're time as Princeton undergrads are ending for good. They'll all be leaving campus next week. Friends, heading in all kinds of directions. Friendships, etched in stone forever. And that was what the banquet is always about. Okay, this really isn't about lacrosse, even if it starts with the final lacrosse top 20 poll of the season. TigerBlog saw it yesterday. Princeton was 15th. That's not what stood out though. The poll had 20 teams in it, with their rankings, record and last game. And there it was, national champion Denver first and then 19 teams who all lost their last game. TigerBlog isn't sure what that's surprising to him. Most teams lose their last game. They have to, or else they'd be the one that won the championship. It's just that TigerBlog never really noticed it in black and white like that before. One winner, and 19 others who lost their last game. It seems pretty harsh. Unforgiving. Not every team loses its last game, of course. Some teams win but don't reach the postseason. In college basketball, basically everyone loses at the end, because basically everyone is in a conference tournament. Only the Ivy League doesn't have a conference tournament. TB isn't going to look it up, though he assumes not every team in every conference reaches the conference tournament, meaning it's possible that there are a handful that win their last game. There was one Ivy League men's basketball team that won its last game of the 2014-15 season. Care to guess which of the eight? Columbia, Cornell, Brown, Yale and Penn all lost their last regular season game. Yale also lost the league play-off game for the automatic bid. Dartmouth lost in the first round of the CIT. Harvard lost in the first round of the NCAAs. That leaves Princeton, who defeated Penn in its last regular season game to end the season. That means that Princeton and Duke, at a minimum, won their last game of the season. What other Princeton teams won their last games? He remembered that men's soccer did, getting a share of the Ivy League title with its 1-0 win over Yale. Women's volleyball did. So did softball. And that's it. TigerBlog is talking about games here. Head-to-head, someone won, someone lost. It's not so bad losing the last game, though. In most cases, it means that at least that team got to the postseason. Even the women's basketball team, who won its first 30, lost its last one. There are no more games in 2014-15 for Princeton Athletics. That doesn't mean that there are no more competitions. There are six teams who are still competing, all four rowing teams and both outdoor track and field teams. This is a huge weekend for all six. For the rowing teams, this weekend is the national championship weekend. For the women's open crew, that means a trip to Sacramento for the NCAA championships. Princeton is one of three schools to have reached all 19 NCAA women's rowing championships, along with Brown and Washington. The men's heavyweights and lightweights and the women's lightweights will be much closer to home, competing at the IRA championships in West Windsor. That's the next town from Princeton, which is good, because both men's teams could have big weekends. Then there's the NCAA track and field regionals. Those are taking place in Jacksonville. At stake is a trip to the final athletic events of the year, the NCAA track and field championships in Eugene, Ore., in two weeks. Princeton will have 22 athletes competing in Florida this weekend. And that will be it for the 2014-15 season for Princeton Athletics. Oh, there's also the little matter of the senior athlete banquet tonight. It's official name is the Gary Walters ’67 Princeton Varsity Club Senior Award Banquet. Among the highlights will be the appearance by Dallas Cowboys' head coach - and former Princeton quarterback - Jason Garrett, who is accepting the Citizen Athlete Award for contribution to sport and society, and the announcing of the Roper Trophy and von Kienbusch Award for the top senior male and female athletes. This year, finalists for both have been announced. For the Roper, it's between five athletes: Quinn Epperly of the football team, Sammy Kang of the squash team, Cody Kessel of the volleyball team, Mike MacDonald of the lacrosse team and Cameron Porter of the soccer team. For the von Kienbusch, it's between Blake Dietrick of the basketball team, Lindsay Graff of the tennis team, Lauren Lazo of the soccer team and Erin McMunn of the lacrosse team. TigerBlog isn't quite done with lacrosse for the 2015 season just yet. Had it not been for Bill Tierney and his seventh NCAA title, TB would have started yesterday where he starts today. Princeton's 1997 team was on the turf at Lincoln Financial Field Monday afternoon, honored at halftime as the winner of the NCAA's "Champion of Champions" contest. TigerBlog came down out of the press box to say hello and take a picture of the team. It's amazing how many players are so instantly recognizable after 18 years. They all have the same exact faces. One thing that is difficult for TigerBlog all these years later is to remember who was on what team. Was he a freshman in 1997? Didn't he play in 2001? Hadn't he graduated by 1996? Their faces, though, are the same as ever. The 1997 team went 15-0 and defeated Maryland 19-7 in the final. The 12-goal margin is still the largest in an NCAA championship game. And there they were Monday. On the field, together again. There were 48 players on the team in 1997, and 40 of them were on the field Monday in Philadelphia. They were joined by former assistant coach David Metzbower, now an assistant at North Carolina. And athletic trainer George O'Neil and Bryce Chase, who are both still with the program. After the brief ceremony at midfield - which included remarks from captain Ben Strutt - the team came off the field and posed for a few pictures. Then it was time to leave the field, as the teams were coming back for the second half. Did the 1997 team just scatter? Head back upstairs to their seats and their families? First they gathered in a huddle. Then someone - TigerBlog thinks it was Jon Hess - yelled "1-2-3," to which everyone else responded "let's go Tigers." It was a wonderful moment. It was the kind of moment that sends shivers down TB's spine. It was, to him, what Princeton Athletics is all about. Here was a group of men 18 years removed from playing together, and yet they were still teammates. That could have been any moment of the 1997 season. End of a practice. Start of the second quarter against Rutgers. Any time. And here they are now, what, in their late 30s, approaching 40, and they've never forgotten who they are to each other. Princeton Athletics. A great experience for four years. A greater experience for a lifetime. There were three disputed goal calls in the championship game, which, if you forgot, Denver won 10-5 over Maryland. If you're a Terp fan, by the way, you can be excused for not being a Tierney fan, now that your team is 0-3 against him in NCAA finals. Denver had two disallowed goals in the game. One was on an interference on the goalie call that preceded the goal. One was a call that the Denver player left his feet on his own and ended up in the crease. One was a Maryland goal that stood when it was very close to being an in-the-crease violation before the shot. Of those three, two were Denver goals that didn't stand and one was a Maryland one that did. TigerBlog has seen the replay of all three plays a bunch of times now. He thinks the interference on the goalie should have been a goal. He thinks Maryland should have been no goal. He thinks the in-the-crease was close and could have gone either way. The fact that that goal also came as time expired in the third quarter added a did-it-beat-the-buzzer dimension to it. He's glad that there's no replay. The refs made the calls. The game moved on. They didn't affect the outcome. Had there been replay, the game would have stopped, the refs would have spent forever reviewing the microscopic calls and nobody would be any closer to knowing whether they were right or wrong anyway. Beyond that, the refs would be hesitant to make calls, fearing what replay might show. This way is so much better. Make a call. Move on. Do not destroy the flow of the game. Of course, replay in lacrosse is inevitable. It's coming. The "get it right no matter what" argument will win out. Except that's not what happens. There is no right or wrong on any of those three calls. The 10 best lacrosse refs could look at those three replays for an hour each and might come back with a 5-5 vote on each call. Plus, one thing that is obvious is that the Denver player who scored the disallowed goalie interference goal was 100% slashed as it happened, with no call. Nothing is worse than having replay not give you a definitive answer to the situation that is permissible to review while an obvious uncalled penalty has to be left uncalled. Anyway, that's TB's take on replay in lacrosse. Maryland's women won the championship Sunday night, which meant that a Maryland win in the men's game would have meant that the Terps would have matched Princeton's 1994 feat of sweeping both championships. That, of course, did not happen, so the 1994 Tigers stand alone still. Speaking of the women's game, Maryland ended the semifinal by stalling the final 7:20 or so and the final by stalling the final three minutes or so. There are no timing rules in the women's game, so stalling is a great tactic, especially if you can do it, much like the "four corners" pre-shot clock basketball strategy was a winning one for Dean Smith. What it doesn't make for is good theater. There wasn't one person in the press box at the men's Final Four who enjoyed watching it, and in fact it drew nothing but universal scorn. This isn't what you want from your showcase event. TigerBlog won't pretend to know enough about the way the women's game works to say how the rules should be tweaked and what would be effective. He does know that if the women's game is trying to market itself, it needs to do something. He's never talked to Princeton women's coach Chris Sailer about this. Actually, next time he sees her he will. And that, it appears, is it for 2015. TigerBlog will remember it for how cold it was all spring. He'll remember the epic performances of Kip Orban and Mike MacDonald and the ridiculous way Zach Currier plays lacrosse. He'll remember the agonizing realization that Princeton wasn't going to be in the NCAA tournament when the selections were being announced. He'll remember that he wanted to tweet something like "great job by Sergio Perkovic with four goals as Notre Dame tied Denver in the semifinals. It still left him 12 goals back of Orban." TigerBlog is bitter that Orban wasn't first-team All-America. He'll remember a fairly entertaining NCAA tournament across the board that lacked a truly great game, which is fine, since the 2015 NCAA tournament was all about Bill Tierney and the history he made by taking Denver to the title. And he'll remember working at his 21st Final Four in 24 years. Barring something unforeseen, he'll be back next year, again at the Linc. Hopefully Princeton will be there with him. He will start 2016 optimistic about that, as he always does. TigerBlog is in the Lincoln Financial Field press box. He's across the field and on the other side of the field from the Denver bench, and his job is to input the stats for the game. He's focused on that task, yet he continues to glance down to see Tierney, in his familiar kneel. And TigerBlog chuckles, in a barely audible way. He's seen this a million times before, Tierney as he kneels. He has picture after picture of it on his computer. He can't help but think back to all the times he's seen this before, all of the great days he and Tierney have had together, all of the great Memorial Days he had with Princeton lacrosse. Now TigerBlog's mind wanders a bit more, between entering stats. So much of TB's life the last two-plus decades has been spent in the sport of lacrosse. So much of his children's lives have been spent in the sport of lacrosse. So many of the friendships TigerBlog has made have been because of the sport of lacrosse. And none of it would have happened had it not been for Bill Tierney. Now the game has ended, Denver 10, Maryland 5. TigerBlog is trying to wrap up the stats, email the game files to where they need to go, all of the stuff that happens when a game ends. As he does this, his phone is in his pocket. It's set on vibrate. It buzzes. It's buzzes again. Over and over and over. By the time he checks it, he's heard from 11 different people, and they all have basically said the same thing. Bill Tierney is the greatest coach ever. TigerBlog can't begin to use enough superlatives to explain what exactly Tierney accomplished yesterday. Sure, he won his seventh NCAA Division I title, the most ever by a head coach. He's also the only coach in Division I history to win a men's lacrosse championship at two different schools. But that's not even half the story. It's not like he won a championship at Johns Hopkins and then went to Syracuse. It's not like he won at Duke and then went to Virginia. He did it in the hardest way possible. He did it in a way that no other elite lacrosse coach has ever shown the courage to attempt, let alone accomplish. Would any other coach who has won an NCAA championship give up all of his current institutional advantages, move 2,000 miles west and start from scratch, while running the risk of failing? Maybe they would, but they haven't. So let's go back to 1987. Tierney left Hopkins - where the Blue Jays won two NCAA titles in his three years as an assistant - to become the head coach at Princeton. It had been 20 years since Princeton had won an Ivy League championship. The team had never played in the NCAA tournament. Princeton was an after-thought, a non-factor in the national lacrosse landscape. Enter Tierney. He told his first recruiting class that it would win a national championship, and then he went out and did, defeating Syracuse in 1992. It was his fifth year at Princeton. By the time he left after 22 seasons, he had won six NCAA titles, played in eight championship games, reached 10 Final Fours and took home 13 Ivy League championships. Then, after the 2009 season - a year Princeton had been ranked No. 1 nationally during the season -he shocked the lacrosse world and headed west, to Denver. When he arrived, he took over a team that had only been Division I since 1999. It had made two NCAA tournament appearances, both after winning the long-defunct Great Western Lacrosse League. It's only two NCAA games were both losses, both against Maryland, neither all that close. This is what he inherited. It would take him one more year than it did at Princeton. And now here's what he's done in six years with the Pioneers: six years, six NCAA tournament appearances, four Final Fours and now one NCAA title. Add it together and it's a total of seven NCAA titles, nine finals, 14 Final Fours. No one else in the sport can match it. Add in the degree of difficulty of doing it at two places had no reason to expect to play for national championships when he arrived and it's just extraordinary. So why is he so successful? Why has he been able to do this? Yes, he's an extraordinary X's and O's guy, but so are a lot of other coaches. That doesn't explain it, even if Tierney has made some of the most copied innovations in the sport. If you asked TigerBlog to explain Tierney's success, he would say two things. First, Bill Tierney is able to manage an individual while managing the overall organization at the same time better than anyone he's ever met. TigerBlog knows this first-hand. In his 20 years of working with him at Princeton, Tierney had a way of making TigerBlog feel like what he was doing was essential to the success of the program. If he could make his athletic communications contact feel that way, what must it be like to be one of his players? And second? Once you are one of his guys, you are one of his guys forever, and you are left with a feeling that you never, ever want to let him down, never want to fail to live up to his standards and expectations. Again, TigerBlog knows this first-hand. He remembers one time in his 20 years of working with him that he got that look from him (after he made a joke in one of those NCAA tournament pregame meetings), the one that said "what are you doing?" That was a long time ago, and it still gives TB the shivers to think about it. Tierney said after the game that he didn't want them to put on his tombstone how many national titles he won. He wanted them to put on his tombstone that his players loved him. The NCAA honors the team that won the championship 25 years earlier at each championship game. The NCAA vacated the 1990 title that Syracuse won, so there was no team to honor. As a result, the NCAA had a contest to determine the "Champion of Champions," which allowed fans to essentially vote for the greatest team ever. The winner was Princeton's 1997 15-0 team. So there were the Tigers, 40 out of 48 of them from the team that won 18 years ago, on the field in the final minutes of the first half, waiting to be honored at halftime. As the final minute of the first half ticked down, Denver was up 5-3, Maryland ball. As the final 10 seconds wound off the clock, the members of the 1997 Princeton team leaned out a bit, as if they were on the sideline of their own game. Then Maryland's Henry West let a shot fly, one that was headed into the net, only to have Denver goalie Ryan La Plante knock it away as time expired. As La Plante made his save, the entire Princeton contingent cheered. In fact, they almost exploded onto the field. Their coach was that much closer to another NCAA championship. They were his players, sort of cousins to the ones who were about to win their own championship. They were his players, and they love him. Still. All these years later. His haters - and he has plenty of them - will never understand that. So, yes, they'll be able to put that on his tombstone. They can also put that he is, without question, the greatest coach the sport of lacrosse has ever known. What he did yesterday leaves no doubt about that. When TigerBlog updates the men's lacrosse record book, he's going to put down that Kip Orban was a 2015 first-team All-America. He was, right? He was first-team All-America. Had to be. After all, he led all Division I midfielders in goals with 45. No other middie in Division I had more than 40. He did this on a team that was ranked in the top 15 most of the year and would be all accounts have been the next team in the NCAA tournament. For that matter, Princeton would have been in had Johns Hopkins not won the Big Ten tournament - instead, the Blue Jays did, and now they're in the Final Four. Orban also had a .413 shooting percentage, an incredible number for a player who almost never took a shot anywhere near the goal. His 45 goals were the Princeton single-season record for a middie - nine more than Josh Sims, who had the next-best season, with 36 in 2000. Oh, and as his coach said, every opponent who played Princeton started out knowing it had to stop Orban and fellow senior Mike MacDonald. TigerBlog will get to him in a minute. So yeah, Orban was first-team All-America. At least in TigerBlog's book he was. Unfortunately, to paraphrase Feech Lamana to Paulie Walnuts in a classic moment of "The Sopranos," TigerBlog's book doesn't mean, well, anything in this case. When TigerBlog first saw the list, he figured Orban and MacDonald weren't going to be as high up as he wanted them to be. And he was right. Orban was a second-team All-America, which is still a great accomplishment, especially for a player who flew so far under the radar his first three years. Of course, Orban deserved to be first-team. TigerBlog gets that it's not just about numbers, but hey, Orban's were so off the charts that in this case they speak for themselves. There were four first-team All-America midfielders: Chad Tutton of North Carolina, Myles Jones of Duke, Connor Buczek of Cornell and Sergio Perkovic of Notre Dame. TigerBlog will say that Orban should have been picked before any of them except Jones, whose ability to feed really sets him apart. More Orban numbers: His 45 goals are 9.5 more than the average of the four first-team picks, who had 35.5 per man. And his shooting percentage is .107 better than the that of Tutton, the best of the first-teamers. As for MacDonald, TigerBlog will say that this is a very, very strong year on attack. MacDonald set the Princeton single-season record for points with 78, beating out Hall-of-Famers and first-team All-Americas to do so. He is also fifth in Division I in points per game and sixth in goals per game. Should he have been first-team? A case could be made. MacDonald ended up as an honorable mention All-America. There were 13 attackmen who earned first-, second- or third-team honors, and there were 12 more who earned honorable mention. The honorable mention group is really, really impressive, which shows you what a strong year it was at the position. Honestly, TigerBlog isn't sure what order he would have put them all in, but it seems to him that breaking the Princeton record for points in a season at least warrants third-team All-America. TigerBlog will be there, for his 21st Final Four in the last 24 years. For the record, the three he missed were 1995, 1999 and 2003. He'll be part of the official stats crew for this Final Four, for the 11th straight year. The Division II and III finals will be Sunday, and the DI championship game will be Monday. 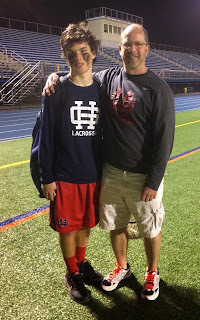 It's one of his favorite weekends each year, and he's been lucky to see some of the greatest lacrosse games ever on some of these Memorial Day weekends. This will be the 21st Final Four for TB, and the 14th that will feature a Bill Tierney-coached team. TB was there with Tierney for 10 of them with Princeton, and now Tierney has taken Denver to the big show for the fourth time in his six years there. The Pioneers have a lot going for them as they head to Philadelphia, starting with the best face-off man in the country in freshman Trevor Baptiste. Add to that an offense that can be unstoppable, especially man up, and a very good defense anchored by a goalie who can be as good as anyone, and that's a pretty good blueprint for success. Notre Dame, though, is the No. 1 seed. The Irish just held Albany to just 10 goals, or seven below the Danes' average. Notre Dame also has scorers of its own, including two first-team All-Americas. Denver has never made it past the semifinals. Notre Dame has never won a championship. One of them is guaranteed to play Monday. The other semifinal has Maryland, the top defensive team in the country, against a Johns Hopkins team that lost to Princeton in February and has six losses but is playing as well as anyone, witness its seven-game winning streak. TigerBlog is obviously rooting for Denver (though his stats will be completely impartial, don't worry). It would be an incredible accomplishment for Tierney to win an NCAA title at a second school, especially one in the West. Oh, and he stumbled on an interesting note this week. The record for points in a career at Princeton is 247, held by Kevin Lowe, who graduated in 1994. The record for points in a career at Denver is also 247, held by current senior Wes Berg. He needs one point this weekend to get the all-time Tierney record. TigerBlog thinks he'll get it, and a lot more. He likes to Denver to win it all. TigerBlog likes to say that the average temperature of the annual senior awards banquet is 70, since it seems like it's either 90 or 50. He hadn't looked at the 10-day forecast for Princeton until just now, and he chuckled when he saw that the forecast for the banquet one week from today is for a high of 93. For the record, TigerBlog will take the under on that one and is predicting a pleasant, comfortable evening. This year's banquet - the 18th such event - will be unlike any of the others in many respects. For starters, it has a new official name: The Gary Walters ’67 Princeton Varsity Club Awards Banquet. To TigerBlog, this is fitting. As someone who has been around for all 17 banquets to date, TB knows better than anyone that this event was Gary's from the start. His fingerprints have been all over it since Day 1. It was his idea. He saw its growth. He was always the voice on the night of banquet. Gary engineered its evolution from its small beginnings in Jadwin Gym to what it is now, a wonderful night of celebration of Princeton Athletics and the graduating seniors, with a crowd well over 500, in a pristine setting at the Grad College. So that's one way this year's banquet will be different. The other is that Gary is no longer the Ford Family Director of Athletics. His replacement, Mollie Marcoux, will be presiding - is that the right word? - over her first banquet. Mollie herself is a former von Kiensbusch Award winner, after her career in soccer and hockey here. She was the lone winner in 1991. She is, in fact, the second Princeton AD to have won one of the two major departmental awards. Royce Flippen shared the Roper Trophy in 1956. There will be some subtle changes instituted by Mollie this year, such as only having one senior give a keynote address as opposed to two in years past. Oh, and there will be one major one. A major, major one. In the past, the Roper and von Kiensbusch winners were announced at the banquet. There could be one winner. There have been as many as seven. This year, there will be a radical change. The Department of Athletics will be announcing the finalists for the two major awards today. At the banquet, there will be one winner of each announced. It's sort of like the Academy Awards, right? Everyone will know the nominees. Nobody will know the winner. There will be four women and five men who will be finalists. At the banquet there will be a video feature with highlights and the accomplishments of each, and then the winner be named. There will be other awards given. The Class of 1916 Cup to the letterwinner with the highest GPA. The Art Lane Citizen Athlete Award, given to an undergraduate (or more than one) for outstanding contribution to sport and society. And then there are the Bressler and Citizen Athlete Awards. By the way, all of these awards, other than the Roper, von Kienbusch and Class of 1916, were Gary's brainchild. There's a long description of the Bressler Award on the Princeton Varsity Club website. Basically it goes to a member of the University community who has done a great deal for the athletes. This year's winner is Tara Christie Kinsey, the outgoing Associate Dean of the College. Trust TigerBlog. This is a very deserving winner. Then there's the Citizen Athlete Award. This one goes to an alum for outstanding contribution to sport and society. And this year's winner? Dallas Cowboys' head coach Jason Garrett. TigerBlog has the same feeling at each PVC banquet. Another year come and gone already? He's sure he'll feel the same way when he gets to the Grad College one week from tonight. On a perfect late spring evening, right? It was 30 years ago today that TigerBlog was given a diploma by the University of Pennsylvania. Graduation then at Penn was held in the Philadelphia Civic Center, a building that no longer exists. That's one way of knowing that it's been awhile since you've been in college. The building for the ceremony is gone. It was a Monday, TB remembers. It was a pretty nice day. When it was over, TigerBlog went back to his dorm room - in one of those three high rise buildings that you see up in the distance if you're at the Penn athletic facilities - and started packing up. He had a Volkswagen rabbit back then, and he couldn't fit all of his stuff into the small car. When it got to be full, he just threw everything else in the garbage. He can still remember getting rid of this small wooden stool. He liked it, but it wouldn't fit in the car. Plus, it wasn't very functional. It just seemed like a waste to get rid of it though. Then TigerBlog left Philadelphia, heading north on 95. Somewhere shortly after he got on the highway, he had the rather chilling thought of "now what?" Sure, he was working at the newspaper then. He'd already been there for two years. Still, he wasn't thinking of that as a full-time, lifelong career. He wasn't sure what he was going to do. He started out at Penn with the idea of going to law school, but that never panned out. He stumbled into sportswriting and liked it, but he figured there was something else out there for him when he actually, well, grew up. That was 30 years ago. He remembers it so well, the feeling of being able to do anything, go anywhere, start down any path. Now it's 30 years later. Had there been a test back on graduation day and he was asked this question: What do you think you will wear to your 30th reunion here, he's pretty sure he would not have written down "a Princeton Athletics shirt." Yes, but that's what he was wearing when he walked on the Penn campus last weekend. It wasn't quite a coincidence. Yeah, he did it to be a bit of a contrarian. Somewhere along the line, TigerBlog went from having spent more time on the Penn campus in his life to having spent more time on the Princeton campus, even after living on campus for four full years. Whenever it was, it was long after TB's allegiance shifted from red and blue to orange and black. TigerBlog connected with two his Penn friends, Charlie Frohman and Rob Lustrin. They spent the afternoon walking around the campus, doing what people do at a reunion - talking about old times, people they knew, stories that may or may not have been exactly how they remembered. The three walked into Steinberg-Dietrich Hall, the home of the Wharton School of Business, of which both Charlie and Rob are grads. They walked in and saw a classroom on the right, and all three said the same exact thing, that they had had Legal Studies in there. Charlie is a wildly successful businessman, and he gave an interesting answer to TB when he asked him if he uses what he learned in that building in his day-to-day work. Charlie's answer was that he learned to be successful among a highly competitive, high achieving student population and that that left him prepared to be successful in business as much as the academic side. Rob, a lawyer, pointed out that he uses the stuff he learned in law school every day. The three met a man who was back for his 65th reunion, which made him about 87 years old or so, though he looked 10-15 years younger. He glanced at the "Princeton Athletics" logo on TB's shirt and said "who let you in here?" Penn is a great university. TigerBlog had a very good experience at Penn. It's just that he didn't feel like he was one of "them" at his 30th. Nope, he thought more like he was one of "us." Princeton is just a different kind of place. And at no time is this clearer than during Reunions (the ones with a capital R). Just out of curiosity, but does anyone think that any alum is showing up at Reunions next week wearing a shirt from another school? Just a hunch, but no. This campus just feels different when the alumni are back. There is an energy and excitement, a sense of loyalty here that just isn't easily matched by other schools. So, Princetonians, that's something you shouldn't take for granted when you're here next week. Or ever. It's a dynamic that TigerBlog has never fully understood, this eternal loyalty to the school, the unbreakable identification with each specific class. To those who are graduating this year, perhaps it wouldn't be a bad idea to write down where you think you'll be in 30 years. 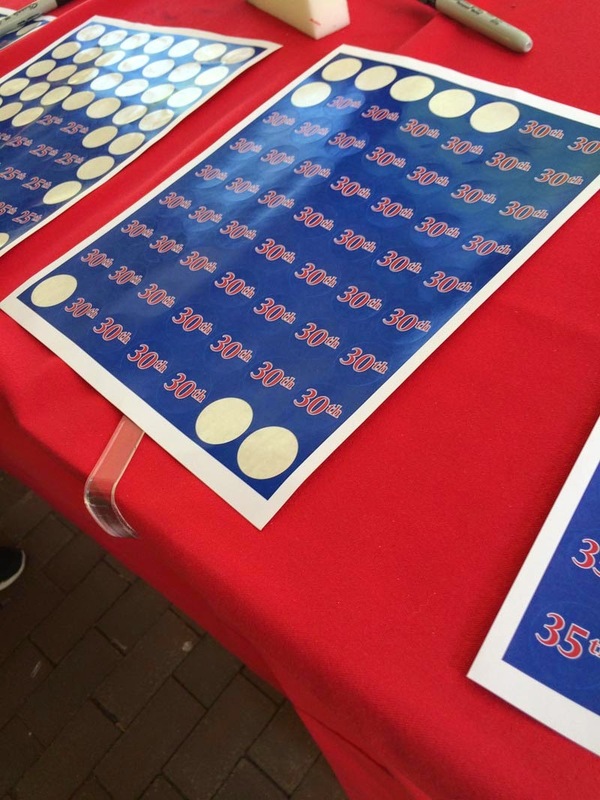 To those coming back for their 30th - or 20th or 25h or 10th or whatever - wear the Reunion stuff. And remember that your college is a little different than the others. In a pretty special way. If you were to walk into TigerBlog's office - and the door is always open - you could walk to the other two offices that make up the Office of Athletic Communications without having to go back out into the hallway. The OAC ends at the third office. There's a wall there, and head men's basketball coach Mitch Henderson is on the other side of it. Next to Mitch is compliance assistant Kelly Widener. There was a time that the OAC actually extended all the way to the end of Widener's office. The OAC had four desks in its back room, plus a little side storage area and then another office that opened out into the hallway, an office that was once the home of Princeton's marketing director. The entry way into the back offices then was the size of a door opening, though there was no actual door there. TigerBlog's office has a door that he can close to shut himself off from the rest of the OAC, though he rarely does. Anyway, there was a little height chart that was on the inside of the frame to the non-existent door to the back room. It actually was just a pencil mark and then a person's name, there to denote the height of basically anyone who wanted to be included. About eight feet off the ground somebody scribbled "Ben, age 12." The "Ben" in question was Ben Samara, who wasn't quite eight-feet tall at the age of 12 but who certainly was tall. Ben is the son of Fred Samara, the longtime coach of men's track and field at Princeton. Ben was a regular in Jadwin Gym as a kid. Ben Samara has lived his whole life around Princeton track and field. And he certainly was a kid when TB first met him. A big kid, but a kid. TigerBlog learned yesterday that Ben is now the head track and field coach at Princeton High School. His father is still the head coach at Princeton University. Where did TB learn this? In the video interview with Samara on goprincetontigers.com. It's an interesting Q&A with Samara, who is tied for the longest current tenure among head coaches here, with, of course, Peter Farrell, the women's track and field coach who started here on the same day in 1977. Has Fred slowed at all lately? Well, Princeton won 11 Ivy League championships this academic year, and Fred won three of them - in cross country, indoor track and field and outdoor track and field. It's the "triple crown" of Ivy League track and field championships, and only two coaches have ever pulled it off. Here's your hint - the both started at Princeton on the same day. Farrell has done it twice with the Princeton women. Samara has now done it seven times with the Princeton men. The video piece on Samara is a very interesting, somewhat revealing look into the man who has overseen so much success during his time here. He talks about his coaching philosophies, his own experiences as an athlete (including the 1976 Olympic Games), his mentors who helped develop as an athlete and many other subjects, including Farrell. Samara's resume at Princeton is unbelievable. He has coached 38 Heps team championship teams between the three sports. He has coached NCAA champions. He has coached Olympians. For TigerBlog, the big question is how does the fire stay lit as long as it has for coaches like Samara and Farrell. When TigerBlog asked the same question of Bill Tierney, his answer was that each year is its own challenge. Perhaps the same applies to Samara and Farrell. Track and field is grueling, perhaps the most grueling of any college sport. It's even more grueling for the coaches than the athletes, TB supposes. It is one meet after another, and each one requires the coach to figure out whom to put in what event, what point of the season it is for each athlete, what the expectations are for each come the important meets. And then one championship event leads directly into the early-season of the next sport, with little time to recharge. To do this year after year, and to do it at the consistently high level that Princeton track and field has achieved, is even more startling. As TigerBlog watched the video, he couldn't help but wonder how many athletes have competed for Fred Samara and if he and Peter have coached more athletes than anyone else ever to coach at Princeton. It's likely, with large squad sizes combined with long, long tenures. TigerBlog sees them every day, the two track and field coaches. They walk by his office one way and then back again. They stop in more than most. They'll come in just to hang out, Peter more than Fred. With Peter, it's a daily occurrence. Fred stopped by yesterday. He sat down for a few minutes, joked a little, and then was on his way. After all, the NCAA regionals are coming up in little more than a week. And then there are the NCAA championships. And then it'll start again. Another year. Three more championships on his record. And then another year. And another challenge. For the remarkable Fred Samara. TigerBlog wants to talk all about the last episode ever of "Mad Men," which aired last night, ending the show's seven-season, 92-episode run. And here's everything TB knows about it: The show as set in the 1960s, everyone smoked and it was about advertising. TigerBlog never watched any of those 92 episodes all the way through. He probably saw less than 60 minutes of the show total. Contrast that with Derek Jones, Princeton's outstanding men's basketball play-by-play announcer and all-around good man. Each Sunday night, Derek has tweeted update after update, and he tweeted last night at 8:00 about how he was ready for "one more go-round." "It's my favorite show ever. Own each season on DVD. I'm definitely very pumped for the finale. My only hesitation about the show tonight is there are so many ways the finale could end that it may be disappointing. Hope it's not a Sopranos finish." TigerBlog has never watched "Mad Men." He knows people who have never watched "The Sopranos" or "Homeland" - (at least the first two seasons of "Homeland" - and he always says the same thing: "How could you have missed that? Those are the greatest shows ever." Well, those two, plus "Hill Street Blues." And "Breaking Bad." In reality, people go their own way when it comes to TV shows. For some, they saw a few minutes of "The Sopranos" and it didn't click, in much the same way that TigerBlog never got into "Mad Men" or any number of other shows. TigerBlog has gotten into "Parenthood," which just ended its six-season run on real TV. He doesn't know a soul who watched it at any point of those six years, and in all honesty he's not sure he ever heard of it. He stumbled onto it on Netflix, and he zoomed through the 13 episodes of Season 1. This leaves him 90 episodes away from being done. That seems like a lot. So anyway, if you were into "Mad Men," TB hopes the last episode was tremendous. These days, there are an endless number of choices for TV shows, between Netflix and on-demand and all. It's not like it was when TB was a kid, when a show was on Tuesday at 8 or Thursday at 10 and that was that, either you saw it or didn't. TB can't figure out why he takes to some shows and never gets past the first 15 minutes of the first episode of others. He'll consider that while he tears through the next five seasons of "Parenthood." Maybe in some way, contemporary television and contemporary Princeton athletes have something in common. There's something for everyone. Princeton has 38 sports, which compete in wildly different ways, venues, cultures and all. The sport-by-sport drop-down menu on goprincetontigers.com is like the Netflix menu, right? Anyway, of those 38 sports, all but five compete for an Ivy League championship. The five that don't are men's water polo, women's water polo, women's lightweight rowing, sprint football and men's volleyball. And of those 33 sports, all have crowned a champion for the 2014-15 academic year. The last three were decided yesterday, when Yale won the men's heavyweight rowing, Cornell won the men's lightweight rowing and Brown won the women's open rowing. Princeton finished second in heavies, second in women's open and third in men's lightweights. And this year, for the 28th time in 29 years, the winner is Princeton. The Tigers had 208 points, outdistancing Harvard, who had 190.5. The Crimson had won last year, ending Princeton's 27-year winning streak. No other school had more than 137 points. Princeton finished with 11 Ivy League championships, one more than Harvard. The next-best was four. Princeton's 11 Ivy championship teams, for the record, were: men's soccer, field hockey, men's cross country, men's indoor track and field, women's basketball, men's swimming and diving, women's swimming and diving, men's outdoor track and field, men's lacrosse, women's tennis and women's lacrosse. And that's that for the Ivy League in 2014-15. "When I originally watched the ending, I didn’t like it. I thought it was too vague in the vain of 'The Sopranos' finish. However, after sitting on it for a bit, I thought it was a good show. It’s evident Don went back to advertising at some point and came up with the 1971 Coke commercial for McCann Erickson. "My biggest problem with the last show was how they used Don throughout it. His ex-wife is dying of cancer and his kids clearly need him, but he is off driving cars and going on yoga retreats. I would have liked to have seen him actually go back home on the show tonight and deal with the issues instead of the audience needing to assume that he did so. "Overall, I thought he worked it out in the long run. The show’s two most important characters are Don and Peggy. Don’s interactions with Peggy were always meaningful and typically led episodes to important moments and that was the case again tonight. "As a whole, the main characters mostly received appropriate conclusions at that moment in time. "For whatever reason, it seems like shows struggle with the series finale and coming up with a finish that satisfies the fans. However, I thought this did the trick and was a rather reasonable conclusion to the series. What one thing could an adult see that would immediately turn that adult back into a child? Before TigerBlog answers, let him say that perhaps he's not the right one to ask this question, given the fact that even into his 50's, he 1) thinks the perfect drink for any social occasion is Yoo-Hoo, 2) loves when he's flipping through the channels and stumbles on the start of a Bugs Bunny cartoon, especially one with Yosemite Sam and 3) can recite Dr. Seuss books from memory. So let's go with the assumption that he's talking about normal adults here. So what is it that can transform a normal adult back into a child? He asks this in a good way. Not a brat. And he doesn't mean immaturity. Into a young, optimistic, wide-eyed child? C'mon, admit it. Go ahead. It's okay. You get a bit nostalgic when you hear the bell ring on the truck, before you can ever see it in your neighborhood. It takes you back to when you were a kid and you'd hear those same bells, and you had to run to find your mother and get a dollar or two before the truck passed by your street. Then, when the truck stopped, you looked at the menu on the side, with the pictures where everything looked so cool and inviting. And then? You got the same thing you always got. Yesterday afternoon around 4 in the apron outside of DeNunzio Pool and Jadwin Gym, the ice cream truck stayed parked and nobody needed to get any money from a parent. Nope, this time it was free. The occasion was a bit of a pep rally, one to celebrate the success of Princeton's spring athletic teams and to give the women's lacrosse team a send-off as it left by bus for the short trip to Trenton-Mercer Airport, where its charter flight to Raleigh-Durham waited to take the Tigers to the NCAA quarterfinals against Duke. The big winner from the ice cream truck appeared to be the vanilla ice cream between the two chocolate chip cookies. Or the snow-cones. Luis Nicalao, the water polo coach whose own women's team competed in the NCAA tournament a week ago, stared longingly at the big picture of an ice cream sandwich on the side of the truck. TigerBlog knows for a fact that multiple people went back for seconds. It was a nice pep rally, a celebration of a very good spring. It was a light moment for the women's lacrosse team, but when the bus pulled away, the trip became all business. Princeton is 16-3 and playing at its very best when it needs to most. The Tigers defeated Fairfield and No. 6 Stony Brook last weekend on Long Island to reach the quarterfinals. Princeton has won eight straight, finishing its 7-0 run through the league and winning the Ivy League tournament along the way. Of the five Ivy League teams to play in the NCAA tournament between the men and women, the Princeton women are the only ones to make it through the first weekend. Erin McMunn enters the game tied with Lindsey Biles, a 2005 grad, for second all-time at Princeton with 221 career points. It'll take a pretty big effort to catch Crista Samaras for first, as she has 270, but still, with all of the great players who have ever played at Princeton - three NCAA championships and 23 NCAA tournaments worth - to be second is extraordinary, especially when you consider she is the career leader in assists. Princeton and Duke are both led this season by players who have 70 points, both on 49 goals and 21 assists. For Princeton it's Erin Slifer. For Duke it's Kerrin Maurer. Slifer, by the way, has 98 career goals. Olivia Hompe has 115 points, making her the fourth sophomore in program history to reach 100 points. The teams have two common opponents, as both have beaten Georgetown and both have lost to Virginia. Duke has a loss to Johns Hopkins, just as Stony Brook did, for whatever that's worth. Duke is 14-3 in NCAA games in Durham. On the other hand, Duke is 6-8 in NCAA quarterfinal games. The all-time series is close, with Duke up 9-8. They've played twice in the NCAA tournament, and each has won once, both in overtime. The Blue Devils defeated Princeton 10-9 in two overtimes two years ago. Duke had a first-round bye and then defeated USC 17-9 in the second round to get here. The game starts at 1 tomorrow. It should be in the 90s. For the winner there is a trip to the Final Four next weekend in Philadelphia. Should Princeton get there, it would deserve an even greater send-off than yesterday, something better than an ice cream truck. Oh wait. There is nothing better than that. The Princeton men's track and field team won the outdoor Heps championship this past weekend, as you probably know by now. Fred Samara, the men's track and field coach, led his team to the "triple crown" of championships in cross country and then indoor and outdoor Heps for the seventh time. No other men's program has ever done it, not even once. Princeton's women have done it, twice actually. No other women's program has ever done it. For Princeton, the men's outdoor title was the 11th Ivy League championship of the academic year. Harvard won the women's Heps, giving the Crimson 10 Ivy titles. For Princeton, it's the 22nd time reaching double figures in Ivy titles in an academic year. For Harvard, it's the eighth time. No other school has ever done so. Princeton, by the way, holds the record, with 15 in 2010-11. This would be the fourth time Princeton and Harvard have both reached double figures in the same year. The other three were 1982-83, 1988-89 and 2011-12. Princeton won six Ivy titles in 2013-14. The last time Princeton went consecutive academic years without reaching double figures? That would be 1991-92 and 1992-93. Princeton has now reached double figures eight of the last nine years. The Ivy League crowns a champion in 33 sports, and 30 of those champions - plus co-champions, in some cases - have already been won. There are three remaining, and all three will be contested this weekend, all on the water, for that matter. It's Sprints week for men's rowing and Ivy League championship week for women's rowing. There is one prohibitive favorite in the three races, and that is the same team as last year - Brown's open women. Of course, a year ago, Brown didn't win as the prohibitive favorite. No, a year ago, Princeton's women won and won fairly handily for that matter. Don't think that's escaped Brown's attention, by the way. The top-seeded Bears already own an eight-second win over Princeton, the second-seed. The regular-season margin last year was three seconds, and Princeton then won at the Ivy championships by more than four seconds, so that was more than a seven-second turnaround. On the men's side, the lightweight favorites are Cornell and Columbia, followed by Princeton. The men's heavyweights? That field is the most wide-open, with Yale as the top seed, followed by Princeton and Harvard, with a Brown team that is lurking. The end of the Ivy League sports season will also see the end of the chase for the Ivy League's unofficial all-sports points championship. This championship is not recognized officially by the league, and it awards points depend on finish in either the Ivy standings or championship competition, depending on how the league crowns its champ, depending on the sport. There are eight points for first, seven for second and so on. In the case of ties, points are split, so two teams that tie for second both get 6.5. Depending on whether you're Princeton or Harvard, you can word the history of the all-sports championship differently. For Princeton, you can say your school has won 27 of the last 28. For Harvard, you can say your school won last year and is the defending champion. Relax, Princeton fans. The Tigers have essentially locked up the 2014-15 championship. Princeton has a 12.5-point lead over Harvard entering the rowing championships. That means that Harvard can win all three boats and have Princeton finish fifth in all three and the Tigers would still win the overall points title. How? Because Harvard would get eight points for first and Princeton would get four points for fifth. Multiple it by three, and Harvard would get 24 points to 12 for Princeton, a 12-point swing that would leave the Tigers still up by a half-point. Of course, TigerBlog doesn't want to jinx anything. On the other hand, it's not a real thing anyway. Meanwhile, TB will go back to dealing with the idea that the 2014-15 Ivy League sports year is about to end, about 10 minutes after it seems like it began. On a night that tugged at his emotional core, TigerBlog remembered back to the first time he ever used his GPS. It wasn't that long ago. At least, looking back on it this morning, it doesn't seem that long ago. It was March of 2012. He was headed to Kennett Square, outside of Philly, to see TigerBlog Jr.'s first high school lacrosse game. The GPS took him this way and that way, on one country road after another, until TB was sure he was completely lost and would miss the game. Then, there it was, on his left. The field. TB remembers the day. It was cold, but not freezing. Mostly what it was was windy. Very, very windy. He remembers a wind that whipped at him from right to left across the field. TigerBlog wore Princeton Lacrosse sweats and a Princeton Lacrosse jacket, and the home fans thought he was a coach there to scout a player. He remembers the game too. TBJ was small at the time, about 10 inches shorter and 40 or 50 pounds lighter than he is now. He was a kid still, playing on a team with a big senior class. A boy goalie on a team of men. The first quarter didn't start out too well. The first shot went in. So did the second and the third. His team trailed 5-2 at the end of the quarter, and he had made two saves. He settled down, though. He would allow only three more goals the rest of the way and finish with 11 saves, including one in the final seconds to preserve a 9-8 win. After he made the last save, he hurled the ball down the field as time expired. He was mobbed by the rest of his team, and TB has a video clip of the play, right down to the massive fist pump TBJ gave. Yeah, it seems like yesterday. It actually was yesterday when TBJ's high school career ended, with a 10-5 loss in the district tournament. He made 15 saves last night, giving him 901 for his career. His 901st might have been his best, as he sprinted back to the crease after a turnover and dove fully extended to slap the ball away just in time. TBJ played 3,470 minutes in goal for his high school team. That's more than 57 hours. He allowed 545 goals and made the 901 saves. He was lucky - he never got hurt, and his team won a lot more than it lost. And then it was over. In a blink, he went from a boy to a man (all 6-1, 190 pounds of him), from a freshman to a senior about to graduate. Gary Walters, the former Ford Family Director of Athletics, used the term "athletic mortality" on numerous occasions. TigerBlog isn't a huge fan of the word "mortality" in this situation, because of its connotations of death. At the same time, he's never come up with a better one. TBJ is one of the lucky ones. He'll be playing in college next year, at Sacred Heart University, or, as TB likes to call it now, "America's Team." Hopefully his college experience will leave him as fulfilled as his high school experience was. Fulfillment, though, is something that needs to be digested over time. Last night was not about feeling fulfilled. It was about feeling the end of something. It was a night for tears, actually. From the seniors. From some of the parents (for the record, TB did not cry). TigerBlog has seen this phenomenon at Princeton for more than a quarter of a century. Of all the dynamics he has seen here, this might be the one that sticks with him the most. He's seen it so many times. Princeton athletes, playing in their final game, knowing they'll never put the uniform on again. He's seen tears. He's heard curses from some whose last game didn't go the way they would have hoped. He's seen Princeton athletes meet the media with great composure and say all the right things. He's seen slammed lockers and broken equipment and long hugs from teammates who know they will never again compete for Princeton. He's been there for celebrations too. Of championships won. Not league championships, which usually are followed by competing in the postseason. TB is talking about NCAA championships. The worst is being in the locker room with the responsibility of having to get someone to talk to the media after a career-ending loss. One of the toughest male athletes TigerBlog has known at Princeton asked him if his eyes still looked too red from crying. You'd think the best is being in the locker room after a national championship. Even then, though, there is the finality of it for the seniors. TigerBlog remembers those seniors from Princeton's NCAA men's lacrosse championship teams. They too were wrestling with their athletic mortality, knowing that no matter what, their time as a Princeton athlete was behind them. It's even worse because very, very, very few seniors end their careers with national championships. Almost every college athlete loses the last game in a postseason championship tournament - or never makes it to the postseason. For all of these athletes - except for the tiny percentage who go on to play professionally - it's the end of a lifetime spent playing a competitive team sport. Yes, many will play again on a club team or a rec team or in unlimited or pickup games, but it'll never be the same. It's not easy to handle all at once, this athletic mortality. For athletes, and for their parents, who have spent the majority of their kids' lives taking them to and from games and watching them develop into athletic and academic studs who could then play at a school like Princeton. For them, the end brings a different kind of void. As for last night, TigerBlog Jr.'s team had a huge senior class. At one point in the game, all 10 players on the field were seniors - with others who played a lot not on the field at that moment. For all of those seniors, four are going to play in college - Grant Toller at NJIT, Michael Major at St. Joe's and Andre Puleo at Cabrini, in addition to TBJ. And that's a lot. For the rest, last night was the end of their competitive lacrosse careers, though one - Michael Kirby - will play Division III soccer at DeSales. TigerBlog focused on TBJ during the final seconds, the game hopelessly lost by then. The ball was on the far side of the field. TBJ looked straight down for the last 20 seconds. When the final horn sounded, he went to the ground, sitting, taking in the unforgiving nature of the final horn. When the game ended, TBJ told TB that the bus from school had dropped them off but not stayed and that he needed a ride back. The two got into TB's car, just as they have been doing after lacrosse games since TBJ was in second grade and TB was his coach, just as they did when TBJ first volunteered to play goalie at the end of that year, just as they did when he became a full-time goalie in third grade. They've spent hours driving back after lacrosse games. Ironically, TBJ's youth career - and TB's coaching career - had ended on the same field exactly four years earlier. This ride was different. For one, TB was driving his son back to school to get his car, where he'd parked it earlier. Life is about taking a series of steps, clearing a series of hurdles. Once they're cleared, it's on to the next. As the hurdle is cleared, focus shifts to the next one. Every now and then, though, there are hurdles that make you look back on them even as you're crossing them. Last night, for TBJ, was one of those. He's lucky. He is not yet facing his athletic mortality, as Gary always said, as so many Princeton seniors now are, as so many generations of Tiger athletes have as TigerBlog watched and wondered what it was like, what was going through their minds. Now he has a pretty good understanding of it. Maybe not exactly, but close. This was it for TBJ's high school days. There's always been an innocence to all of this - "little kids playing ball," TB's friend Jack has always called it - and now that's gone. TigerBlog knew it. TigerBlog Jr. knew it. Neither really said anything about it. TigerBlog thought about the right words, but they escaped him. In the end, all he said to his son was that he was proud of him. TigerBlog was midway through the North Carolina-Colgate men's lacrosse game Sunday when he finally drew the line. It was, after all, his seventh NCAA lacrosse game of the weekend. All on TV. None in person, which is where he'd rather have been, had Princeton been in the tournament. So where to start with the eight games that made up the first round of TigerBlog's favorite NCAA tournament? Let's start with the Ivy League, which went 0-3 in the first round as Cornell lost to Albany, Yale lost to Maryland and Brown lost to Denver. The performance of the league has led some to question whether or not there should have been three Ivies in the tournament or if the Ivy League should have had multiple bids this year after a similar 0-3 record a year ago. TigerBlog finds this thinking ridiculous. First of all, saying the Ivy League didn't deserve the three teams it had in the tournament means that there was another team that should have been there. In this case, the next team in the tournament would have been Princeton, another Ivy team. Performance in the tournament does not equate to a justification of getting a bid. It's about who else should have had one. An even bigger reason to TigerBlog why the Ivy League shouldn't be looked down on in this tournament is that he thought from the first time he saw the draw that it should have been done differently. And this isn't about Princeton's exclusion. If TigerBlog had to take the teams that were selected and seed them and match them up, he would have changed the bottom three seeds. The first five were fine - No. 1 Notre Dame and No. 2 Syracuse could have been in either order, followed by Carolina, Denver and Duke. From there, TigerBlog would have had Albany six, Yale seven and Maryland eight. Cornell wouldn't have been seeded. Why? Because TigerBlog believes a team's overall body of work, to use the committee chair's words, should count more than head-to-head results from February. Yes, those games matter, but they shouldn't matter nearly as much as they do. Cornell's win over Albany - in an ice storm in Dallas on Feb. 28 - was what got the Big Red a home game. By the end of the season, Albany, winner of nine straight, was playing as well as anyone. So, in the matchups, Cornell would have been at Albany. The result would probably have been the same, but it wouldn't make it look like the seeded team lost and that it was an upset. And a side note on Albany-Cornell: the goal by Great Danes' goalie Blaze Riorden was extraordinary on a lot of levels, not the least of which was the velocity he had on his shot. Didn't see it? Click HERE. As for the rest of the matchups, Virginia should have been at Denver. Brown should have been at Maryland. Hopkins should have been at Yale. Brown and Yale? Those would both have been 50-50 games. Oh, and speaking of Virginia, the Cavs were run off their home field by Hopkins, losing 19-7 in a game that wasn't nearly that close. As a reminder, Virginia was 0-4 in the ACC and unbeaten outside of it prior to the Hopkins game. Of UVa's 10 non-league wins, seven were: Loyola, Drexel, St. Joe's, VMI, Richmond, Rutgers, Georgetown. That's one top 20 win - Georgetown. The other three were: Hopkins 16-15 in OT, Cornell 15-14 and Penn 12-6. Princeton, who didn't get in, had a 16 -15 win over Hopkins in OT, a four-goal win over Cornell (and a five-goal loss) and a six-goal win over Penn. Princeton had one more top 10 win than UVa did, with its wins over Cornell and Yale. Princeton and Virginia had very, very similar resumes. Princeton didn't get in. Virginia got in - and was a seed who played at home. Why? Because UVa is in the ACC. Speaking of the ACC, Virginia lost big at home and Duke lost big at home. The top three seeds all won, but they aren't going to be judged by getting past Round 1. If all three remaining ACC teams making it to Philadelphia for the Final Four, then the league will have solidified its claim to being by far the best league in lacrosse. To do so, it will require Syracuse to beat sizzling Johns Hopkins, Notre Dame to beat even more sizzling Albany and Carolina to beat a Maryland team that can throw a blanket over anyone and who already owns a win over the Tar Heels. Oh, and one more thing about Round 1. Yale lost 8-7 to Maryland and may or may not have tied it on a shot from Michael Keasey that may or may not have gone in in the final 20 seconds. Keasey's shot beat Terps goalie Kyle Bernlohr and hit the pipe, dropping either into the goal or just outside of it. The officials said it was no goal. In college lacrosse, there is no replay except in the NCAA tournament and only to determine if a shot was out of a player's stick prior to the end of a quarter. TigerBlog wants to keep it that way. First of all, if there had been replay in the Yale-Maryland game, it wouldn't have changed that call, because it was so microscopic one way or another. And if replay were to be introduced, it would be like college basketball, where the flow of games are completely destroyed by replay reviews. Besides, TB doesn't want to see replay unless it can be used to review judgement calls as well, like the one that gave Yale possession after a Conrad Oberbeck shot on the possession that led Keasey's shot. So there you have Round 1. TigerBlog is looking forward to this weekend to see how it shakes out and of course the Final Four next weekend. And the 2016 tournament. Hopefully with Princeton in it. Princeton's top athlete yesterday was, well, TigerBlog isn't quite sure. Where to start? How about on Long Island. TigerBlog thought the Princeton-Stony Brook women's lacrosse game was at 1, not noon yesterday. When he put the video for the game on, there were six minutes to play. Guess what TB never saw? If your answer was "the ball in a Stony Brook stick," you'd be correct. Princeton defeated Stony Brook 8-4 in the second round of the NCAA tournament, advancing to the quarterfinals this coming weekend against Duke. The Princeton-Stony Brook game was even at the half at 3-3 before the Tigers scored the first three of the second half. When TB turned the game on, Princeton was up 6-4 and had possession with six minutes to go. And then with five. And four. And three. And two. And one. Never in that time did Stony Brook get possession, though the ball was on the ground a few times. Women's lacrosse does not have the timing rules that men's lacrosse has. It doesn't have any timing rules, for that matter. You can argue whether or not the sport needs it. What you can't argue is that Princeton was surgically efficient in killing the clock. Princeton has several opportunities to go to the goal but instead chose to maintain possession. Eventually, in the final 30 seconds, Princeton did score - and then scored again. Hey, if you can possess it the way Princeton did, why shoot? In that case, shooting is going to bring about a few outcomes, most of which weren't better than simply having the ball and keeping the clock running. A miss? A save? Stony Brook could get the ball back. A goal? There'd be a draw control, and Stony Brook could again get it back. The Seawolves, for that matter, would have taken that in a heartbeat, down 7-4, three or four minutes left, draw control. So Princeton held it. And held it. And ran out the clock on a team that had beaten Northwestern and Florida, had been 18-1 and was the sixth seed in the tournament. Princeton's usual suspects on offense are Erin Slifer, Erin McMunn and Olivia Hompe. In the game yesterday, the Tigers instead got four goals - half of their offense - from freshman Abby Finkelston. Before yesterday, by the way, Finkelston had five goals for the year. Surely Finkelston was Princeton's top performer yesterday, no? Stephen Soerens was so fast, fast enough to give the men's track and field team the Ivy League Heptagonal championship, by a razor-thin margin. Soerens won the decathlon, sprinting to the win in the 1,500 to put him over the top. It also put Princeton over the top. The Tigers were supposed to win, but Cornell had some other ideas. In fact, the Big Red led by as much as 22.5 points with eight events to go. Cornell still had the lead after the 4x400 relay. That left only the 1,500 for the decathlon, and Soerens needed to win it to get the 10 points that Princeton would need. Soerens and Bryan Oslin went 1-3 in the 1,500 and finished 1-4 in the decathlon. The two gave Princeton 14 points for the event, six better than the eight Cornell got from Austin Jamerson's second-place finish. The Tigers would win by 3.5 points - 163.5-159. Had Soerens not won the decathlon, then the points in that event would instead have been 12-10 for Princeton, and the final score of the entire competition would have been 161-159.5 in favor of Cornell. So surely Soerens was the top Tiger Sunday, no? Yes, Soerens and Finkelston won. And yes, Ashleigh Johnson did not. But how much better could someone be than Johnson, the goalie for the women's water polo team? Johnson made 22 saves in Princeton's 6-5 loss to UC-Irvine in the fifth-place game at the NCAA championships. Twenty-two saves? Is that a lot? Well, it ties her own program record and bettered the old NCAA tournament single-game record of 18. And for the three-game tournament? Johnson made 50 saves, an NCAA record. The old record? Well, it was 40. Johnson destroyed that. So who was the top Princeton performer of Sunday? How about a three-way tie for first? It is TigerBlog's belief that some multinational tribunal/conglomerate is responsible for the fact that Princeton isn't in the NCAA lacrosse tournament. It had to be some sort of conspiracy. It's been a rough week for TigerBlog, who thought the Tigers had a legitimate shot at playing this weekend. To be honest, he'd rather be in Durham or Denver or Charlottesville right now, getting ready for the tournament. Princeton was done in by Johns Hopkins' win over Ohio State in the Big 10 final, not to mention its loss to Yale in the Ivy final. And its regular season loss to Brown. And so it was that the stars didn't align for Princeton the way TB had hoped. He'll be at Lincoln Financial Field in two weeks for the NCAA championships. It'll be his 11th straight Final Four as the official scorer and the 21st Final Four in 24 years. Who will be there with him? He'll go with Denver, Albany, Syracuse and North Carolina. He'll take a Denver-Syracuse final and a Denver championship. Meanwhile, there are still all kinds of Princeton athletic events that remain in the 2014-15 athletic year. This is a big weekend for the Tigers, though none of it is home. In fact, the only remaining home events are next weekend, with the IC4A and ECAC track and field championships. This weekend starts today with three NCAA tournament events, in three different states and two different time zones. The first one is at 10 this morning, when the men's tennis team takes on Minnesota in Charlottesville in the first round of the NCAAs. For Princeton, it is its first NCAA match since 1998. The winner of the Princeton-Minnesota match will take on the winner of St. John's-Virginia tomorrow at 3. Princeton is ranked 36th in Division I; Minnesota is No. 25. Here's an interesting fact about Princeton: Minnesota will be the 18th ranked opponent Princeton has faced this season. The Tigers are 9-7 against ranked opponents this season and have been as ranked as high as 23rd in late February and early March. That ranking was Princeton's highest on record since 1980. Princeton has an at-large bid in the tournament. That alone is impressive. Next to get started will be the women's water polo team, which plays Stanford at Stanford at 3 Eastern time. Princeton is guaranteed three games in California in the NCAA championships. Princeton is appearing for the third time in the last four years and is 4-3 overall after defeating Wagner 12-2 in the play-in game last weekend. There are eight teams in the field. One is Princeton. One is Hawaii. The other six are from California. Princeton is led by junior goalie Ashleigh Johnson, who already holds the program record with 1,012 career saves. The women's lacrosse team opens the NCAA tournament at 7 at Stony Brook against MAAC champion Fairfield. The winner of that game takes on Stony Brook Sunday at 1. Princeton will be dealing with one of the top defenses in Division I with the Stags, whom Princeton has never met. Fairfield actually ranks fourth in Division I, allowing 6.83 goals per game. The Tigers, on the other hand, score nearly 12 goals per game. Those three teams compete today in the NCAA tournament. There will definitely be a Princeton tennis team that plays in the NCAA tournament at UVa tomorrow. The question is whether there will be two. The women take on South Carolina tomorrow morning at 9. The winner gets the winner of UVa-VCU, Sunday at noon. Princeton made national waves a year ago when it knocked off Arizona State in the first round of the NCAA tournament and nearly took out No. 2 Alabama. Princeton is making its sixth NCAA appearance in women's tennis. So that's four teams who will be in the NCAA tournament this weekend. That's a lot, by the way. There is also the little matter of the Ivy League Heptagonal track and field championships at Penn. The Princeton men and the Harvard women are the favorites. And that's a pretty full weekend. Oh, and one more thing before TB leaves you til Monday. He was talking to someone yesterday who told him that they had read that a lot of the facts on Snapple caps aren't true. This is very disconcerting to TB. For instance, yesterday TB read that cats have two separate sets of vocal cords, one for purring and one for meowing. Who would make that stuff up? Have a great weekend. Go Tigers. The 50-yard-line logo on Powers Field at Princeton Stadium is the university's shield. Each end zone bears a tiger head logo and the word "Tigers." Taken together, the painted field markings at Princeton are different from those at any other Division I football stadium and have held that distinction for one season, after Notre Dame changed the logo on its field in 2014. What is that difference?Answer: Princeton has the only on-campus football field in Division I whose painted markings include neither the name of the school nor its first initial. Until 2014, Notre Dame's field design was even more spare, with no logo at midfield and only diagonal lines in the end zones. Last season, the Fighting Irish switched from natural grass to FieldTurf and, in doing so, added their monogram "ND" at midfield. And there you have it. Who knew? You want to know what the most incredible thing about this is? It's that TigerBlog believes it, without question, even though it came without an documentation from a person who posted it anonymously. It could be anyone who posted that. It could be true. It might not be true at all. Who knows? It doesn't matter. TigerBlog believes it. One of TigerBlog's firmest beliefs is that people believe what they read. It's like Matthew Broderick said in the movie "Biloxi Blues," people figure it must be true, or why else would someone go to the trouble to write it down? There is a corollary of course. That is that certain people believe nothing they read and will do anything to disprove what they read. TigerBlog has been known to be cynical at times. In this case, he figures this has to be true. Who would make this up? So there you have it. Princeton Stadium is the only Division I football stadium where neither the school name nor the initial appears on the field. Anyway, speaking of football and cynicism, it was a field day yesterday for those who may have had a doubt or two about Tom Brady's veracity when it came to deflating footballs. The NFL released it findings yesterday, and they were not flattering to Brady or the Patriots, who nevertheless acted as if they were being persecuted. As TigerBlog said at the time: guilty, guilty, guilty. Oh, for those who want to point out that the Patriots crushed the Colts in the game, TB reminds them that there was no guarantee beforehand, when the balls were being deflated, that this was going to be a blowout. And, as TB also said at the time, he does not believe that this was the first time New England did this, just the first time the team was caught. So what should the punishment be? Simple. Brady should be banned for a year. This is cheating of the highest order, way up there with PEDs. And his career accomplishments? To TigerBlog, they're all completely tainted after this. Who knows how many times they've done this before? Who knows how many other rules have been broken? Anyway, where can TigerBlog go today for something genuine? The heavyweight rowing video that was on goprincetontigers.com of course. Princeton was rowing against Brown for the Content Cup, and the Tigers were seven seats back with 500 meters to go. By the end, Princeton had caught the Bears, winning by 0.7 seconds. There are two great parts of the video. The first is the commentary at the end. That is genuine, genuine excitement - complete with the, uh, borrowing, of the most famous line in American sportscasting history. The second is the reaction of the Brown coxswain. That too is genuine. Genuine frustration at having come so close to a big win and falling just short. It's also an acknowledgement that, on this day at least, the team's best was just a little too short. TigerBlog has a lot of respect for that kind of genuine physical and emotional commitment. The men's heavyweight rowing team is one of five teams that has not yet competed for the Ivy League championship this academic year. The five remaining championships are in men's and women's outdoor track and field (this weekend at Penn) and then the rowing championships next weekend. Princeton's heavyweight men have one loss this year, to Yale. Brown, obviously, is a contender, at least according to the video. And Harvard is also right there. The final at Eastern Sprints, which determines the Ivy champ, could be a great one. It'll have to be to match the emotion from the Princeton-Brown race. Do you believe in miracles. It's easy, TigerBlog knows all too well, to take for granted the uniqueness and special nature of Princeton University. When you go there every day, like TB does, then it's easy to forget that you're on a campus with a history and beauty that a very, very few in the entire world can match. Every now and then when he least expects it, TigerBlog gets a subtle reminder. One such reminder came yesterday, in the form of an email from Dan Day, his colleague in the University's communications office. Dan's email included a link - this one, to be exact - that took TB to the Princetonian section of the princeton.edu website. TigerBlog was actually asked two weeks ago or so to put together some pictures of Princeton's spring athletic teams for the Princetoniana site. In all honesty, he'd forgotten about it until Dan's email. TB had never been on the Princetoniana site before that email. Now? He could spend hours and hours on that site and check out every corner of it. If you're a history fan and a Princeton fan, then there aren't too many better intersections. The word "Princetoniana" conjures up images of what TB was trying to express about the beauty and uniqueness of this place. The site itself is endless reinforcement of that. The first place TB ended up was on Princeton's oldest newreel footage, dating back more than 100 years, to the inauguration of Princeton president John Hibben. Among those in the video are U.S. President William Howard Taft and the man who would take over for Taft, former Princeton president Woodrow Wilson. Then there was the "Princeton postcards" section. These were actual postcards of Princeton campus scenes through the years. Many of the places that are featured still stand in pretty much the same exact manner as they did back then. It's not always easy to place them, though, as so many other surrounding landmarks weren't there yet. TigerBlog's favorite is No. 14 - the boathouse, with water that winds around in front of it. Anyway, the site is incredible, especially for someone like TB, who appreciates stuff like this. Then there's the newest section, the one with the pictures from Princeton athletics. The request TB got was for a mix of old and new pictures, and that's certainly what the final project reflects. There are 35 pictures in the slideshow, and they aren't labeled. The first one is of an 1800s baseball team. The last one is of the 1992 men's lacrosse team as it celebrates the NCAA championship. Picture No. 4 appears to be Emily Goodfellow, a 12-letter winner and an early women's sports pioneer here, as she cradles her stick in lacrosse in only one hand. Yeah. That's Emily. She looks the same now. Picture No. 5 got TB wondering if the high jumper clears the bar. Picture No. 10, is that in Palmer Stadium? Picture No. 24 is a modern-day men's rowing team. Picture No. 25 is the same team, decades and decades ago. Picture No. 30 is Julia Ratcliffe, a wide-angle view from the ground up in the hammer circle. No. 33 is Ashleigh Johnson, who is effortlessly deflecting a shot before it reaches the top corner of the goal. There aren't many water polo goalies in the world who could have made that save. There are a handful of pictures that fit the profile of what is known as "jubo," or jubilation. For sheer unbridled jubo, though, it's hard to beat a picture that wasn't part of the Princetoniana website. No, this one was a picture of Charlie Weaver, the younger brother of Princeton shortstick defensive middie Bobby Weaver. It's a screen shot of the ESPN3 broadcast of the Tigers' 11-7 win over Cornell in the Ivy League tournament semifinals this past Friday. TigerBlog saw Charlie during the game. He was hard to miss. He wore a Princeton lacrosse t-shirt - shortsleeve, on a chilly evening - and a Princeton lacrosse hat, with Princeton sweats. He knew every Princeton fan, and they all knew him. He was by far the most excited person in the facility when Princeton scored. He even high-fived TigerBlog. It was yesterday afternoon when Princeton men's lacrosse coach Chris Bates sent the picture to TigerBlog, and TB couldn't help but smile at the sheer joy and love that Charlie reflects as the final seconds tick away. It might not be part of the website display, but that's Princetoniana.